First let me set the scene. Back in 1983/84 I ‘lived’ in a student short-life house in Clapham Old Town, south London. I say ‘lived’ because I really wasn’t supposed to be there at all. How I managed to live there most of the time is a long story, I’ll leave it at that. It was a big short-life house that was basically three terraced townhouses that had been gutted and joined together so you could go in one front door and out of another – yep a bit like the houses in the Beatles’ film – so there were a lot of people that lived there. One of the residents swore he’d been taught piano by Howard Jones, something that impressed us hugely at the time – look it was the 80s I’m not going to apologise for that. Anyway I sort of fell in with a geology student – whose name unfortunately I can’t drag out of my brain – because the friend I stayed with wouldn’t let me smoke in their room, and we spent many happy hours smoking ‘yellow box’ cigarettes sitting on the stairs outside his room. ‘Yellow box’ cigarettes came from a cheap supermarket and cost around half the price of average cigarettes (which was important when you earned not very much money as a cycle courier). The disadvantage of ‘yellow box’ cigarettes was that about one in six cigarettes would empty themselves out of the ‘tube’ when you took them out of the packet. If you’re wondering why we didn’t actually sit in his room and do this, I have no idea. We were students – well at least he was, I was a part-time cycle courier who attended college on a very part-time basis – perhaps we both thought that’s what students did, sit on the stairs and smoke. Musically we didn’t have that much in common if I’m honest. I was deep into a Creation Records phase at the time, mainly because in my part-time job as a cycle courier one of our clients was Creation Records (they had an office in the building the courier company I worked for was based). He liked stuff that I may have liked at one time but in an effort to be hip and trendy I was denying I liked. Being in the same building as Creation was cool – we got used to seeing leather trousered bands in the building reception area, and being asked what we thought of various recordings. And once I accidentally ‘worshipped’ Poly Styrene. I came running down the stairs on a job and tripped, noticing simultaneously that she was sitting in the reception area. I fell full length at her feet. She looked down at me with an expression I can only describe as serene amazement, as I mumbled that I was sorry, and that I was a huge fan. Anyway back to the geology student, one evening he told me about his industry placement in Australia, and he casually mentioned that he’d seen ‘this band’ while he was out there and put on a tape he’d got. He told me that they were called Redgum, that this was a live album and that he’d “have to explain some of the songs to me”. He also told me that Redgum were the official band of the Australian Communist Party, a fact that I’ve been unable to confirm in my research. In the first minutes I was hooked, this was brilliant. I’ve loved this album ever since. I even went to the extent of ordering the CD from Australia. 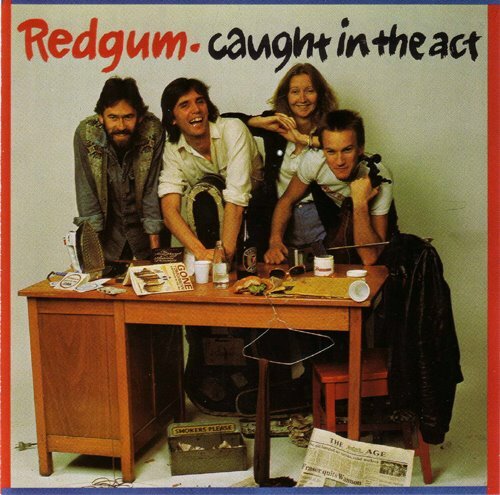 Redgum were an Australian political music group formed in Adelaide in 1975 by singer-songwriter John Schumann, Michael Atkinson on guitars/vocals and Verity Truman on flute/vocals. They were soon joined by Chris Timms on violin. They stopped playing together in 1990. ‘Caught in the Act’ was released in June 1983 and was their fourth album, and only live recording. Redgum played in the UK in 1984 including dates in London where I was lucky enough to see them. Although at one gig I fairly sure I was the only non-Australian present. I’m going to have to admit two things before I go on. Firstly Redgum are unashamedly left wing – there are songs about poverty, an anti-war song, and a song about the impact of multi-national companies in Australia. There are also plenty of songs that comment on the attitudes of Australians at the time. However these have universal meanings, and current relevance, even though some of the references are Australian. Secondly, a few of the references in the songs are going to be fairly baffling and might have you reaching for Google. I, of course, had the helpful assistance of the ‘geology student’ to explain it to me. Having said that the songs range from incredibly moving, to laugh out loud funny with side trips into songs that make you think. I suppose you could describe their music as folk-rock or as folk influenced rock but this is the starting point for their music they go way further. I also need to emphasise that this is a live album. Many of the songs are extended by improvised material or sections that have been added to the songs. The album is probably best known for the performances of the songs ‘I Was Only Nineteen’ and ‘Caught in the Act’. Not all songs about the war in Vietnam came out of the US, ‘I Was Only Nineteen’ is more properly called ‘I Was Only Nineteen (A Walk in the Light Green)’ and is about two friends of John Schumann’s who went to Vietnam. The alternative title ‘A Walk in the Light Green’ comes from the Australian soldiers who knew that if their patrol route was shown as crossing dark green on the map they’d be OK because this was thick jungle but if it crossed light green areas they were likely to hit mines. The performance on ‘Caught in the Act’ is chilling. ‘I Was Only Nineteen’ got to number one in the Australian charts so tv appearances are available and you can watch and listen below. The version of ‘Caught in the Act’ on ‘Caught in the Act’ (if you see what I mean) is hugely extended. It’s extended with what can only be described as a way of defrauding your credit card company out of the cost of a holiday. I wouldn’t dare endorse this but the track is laugh out loud hilarious. Look out for Redgum’s trademark working in of other songs into their songs on this, and sound effects. There’s not one dud song on this album so I’m going to mention a few of my favourites. ‘Stewie’ is a song about a guy whose life went wrong. It’s hugely emotional but also comments on the Australian system’s failure to save him. Commenting on the apathy of the Australian right-wing voting middle classes ‘It Doesn’t Matter To Me’ is both funny and bitingly effective. ‘Beaumont Rag’ needs some explanation. Beaumont is an affluent suburb of Adelaide and the song sets out to, and succeeds in, sending up the Liberal Party voters who live there. The background is the defeat of the Australian Liberal Party and their leader Malcolm Fraser by the Australian Labour Party. This might make it sound as though it’s a heavy handed political song but no, there are some very very funny additions to the song. Droving was as much a part of Australian farming as it was for us and ‘The Diamantina Drover’ is a moving song about the life of a drover. Can I still get this album? ‘Caught in the Act’ is available on the Australian iTunes – there’s probably ways of getting at that, I suggest doing a Google search. Redgum songs are available on the UK iTunes but unfortunately not the live versions. CD copies of the album are available on Amazon and Ebay at the time of writing. There are places where fans have shared the songs, as this is probably not entirely legal I can only suggest a Google search. Songs have been shared on YouTube. If you’re really keen you might try Australian music forums which is where I found a store that would ship it to me around 10 years ago.